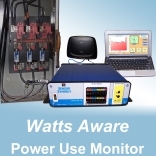 Buffalo Grove, IL -- Watts Aware is an affordable, easy-to-deploy, new way to remotely monitor and analyze electrical power usage within an industrial or commercial facility. Inefficient plant operational practices can be quickly identified and corrected, resulting in tens of thousands of dollars of utility cost savings. This is achieved by measuring and sharing real-time power consumption information for large motor-driven machines, manufacturing work-cells, HVAC, lighting or groups of electricity consuming equipment. Usage patterns for the largest electricity consumers are quickly identified. Malfunctioning machines or systems not shut down at the end of a shift become apparent with Watts Aware Dashboard software. Unlike more costly power monitoring systems, Watts Aware can usually be installed within an hour, without interrupting the operational status of the equipment to be monitored, thus avoiding costly shutdowns. Watts Aware is the latest remote monitoring solution from Sensor Synergy, Inc., a well-established manufacturer of stand-alone, "Network Enabled Equipment Monitor" products. Their patented "smart-interface" technology makes it possible to quickly connect multiple sensors and clearly display results remotely on a web-based graphical user interface. The Watts Aware WA-118 is a complete package that can be installed by plant personnel within an hour. After installation, the Watts Aware Dashboard software is immediately ready to display and track power usage in graphs and tables. The WA-118 system includes three 200 amp capacity current sensors and three 500 amp current sensors, a pre-configured netbook computer, the Watts Aware Data Acquisition Unit, a wireless router, all software and all cables required to make the system operational out-of-the-box. The rate of electrical power usage is measured and displayed in real-time, with less than a two-second delay between electricity consumption changes and computer display. The wireless feature enables facility managers to view power consumption changes instantly, on the netbook's display, at their desk or anywhere. The data can also be reviewed at a later time, or loaded into any popular spreadsheet program and displayed on any PC. This unit is well suited for extended-duration monitoring, in which the power routed through a power distribution panels is continuously measured and recorded. Power usage can be tracked for weeks or months without endangering workers with exposed voltage probes, delicate alligator clip measurement leads, or costly conduit installations. And no disruptive power outages are needed during installation. Typical application examples include tracking power usage by large, power-hungry devices such as air compressors, large electric motors, process ovens, HVAC, and refrigeration equipment. The information provided to managers from Watts Aware systems can often payback investment in just a few months, and then continue to provide ongoing savings. Once installed in a facility, the WA-118 can quickly identify such power wasters as equipment that was not shut down at the end of a shift, use of power-hungry oversize compressors for small tasks, malfunctioning equipment or equipment that should be serviced or replaced with newer, more efficient designs. In addition, long-forgotten legacy "power drains" are often identified and modified to better reflect current needs. The Watts Aware data can also help identify processes that should be run at different times to better manage "peak demand charges" and to better take of advantage of lower rates during off-peak hours. With the WA-118, a plant or facility manager becomes empowered to reduce electricity consumptions costs by experimenting with different settings for compressed air systems, furnaces, facility temperature changes, and various batch production processes. Managers and operators can observe in real-time electricity cost savings resulting from process and other operational changes. Watts Aware is self-contained, with no subscription fees, programming cost or additional dedicated data acquisition computers. Real-time power monitoring data can be accessed securely with Sensor Synergy's intuitive "dashboard" software from anywhere in the world. Multiple plants can be monitored from one location, with easy comparison of data. 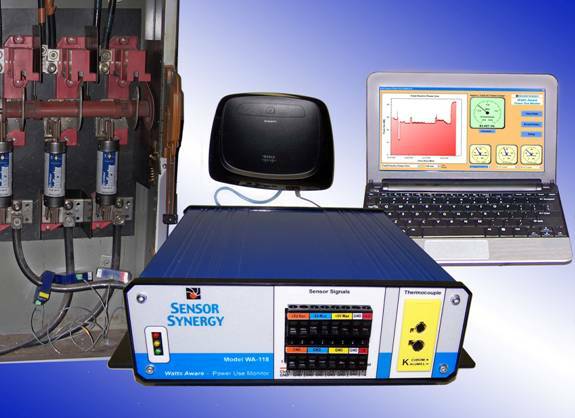 Sensor Synergy, Inc. is a U.S. corporation founded in October 1999 to help industry simplify the task of connecting sensors to the Internet and local networks. Sensor Synergy has developed unique software and hardware tools to implement low-cost sensor-to-Internet interfaces. These products have been used for remote monitoring of industrial processes, environments, and other operational applications, through standard internet-connected Web browsers and Sensor Synergy's logging software. The Watts Aware system is the latest application of this patented technology.